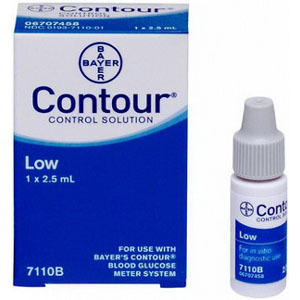 The Bayer Contour® Normal Control Solution is designed to check the accuracy of your glucose meter and test strips. Simply apply a drop of the Contour® glucose control solution to a test strip and run a standard glucose test. Confirm that the test results are within the accepted range printed on the test strip vial. It is advised to test your glucose meter and strips accuracy on a regular basis. Designed to check the accuracy of your glucose meter and test strips. Designed for use with the Bayer Contour or Microfill glucose meters only. Printed test strip vial included within the pack.